The word resilience has different meanings in different fields. In the field of material science, it refers to the ability of a material to regain its shape after it has been stressed. A rubber band, for example, will regain its shape after it has been stretched, but a paper clip does not do so nearly as well. Therefore the paper clip is less resilient. I learned from the eminent ecologist Deborah Wallace that, in ecosystems parlance, the term resilient refers to the ability of systems to stabilize after disruption. Systems that are able to restabilize are considered resilient, but this does not mean that they regained their former organization, only that they have settled into a new pattern. That new pattern might be quite dysfunctional from the perspective of peaceful co-existence. Today, at “The 2013 ResilienC Symposium“ in Philadelphia, I heard a remarkable story about resilience in this ecological sense. Alex Keating, project manager for global initiatives at the Penn Institute for Urban Research, talked about his work in Belfast, Northern Ireland, 10 years after the peace protocols had ended the decades of violence known as “The Troubles.” Belfast was highly segregated by religion, with sharp borders between Catholic and Protestant areas. High walls were eventually built separating those areas, meant to keep peace. Since the peace accords, some aspects of the violence have declined, specifically number of murders, but injuries have increased. The walls have not come down, and, in fact, more walls have been erected. 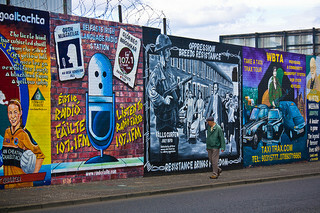 Keating closed his talk with a photo of a wall that runs through Alexandra Park in Belfast, the world’s only walled park. Despite changes, the landscape of bitter segregation keeps reasserting itself, defining the social relations in the city. In Philadelphia, a city that is suffering with serious violence, this story seemed both different and familiar. Philadelphia does not have walls of brick, and people are not divided by religion, but they are divided, and violence has been a tenacious feature of city life. Like the situation in Belfast, this represents a shift in the social organization, one in which violence is all-too-common in daily life. What is to be done in the face of stable social systems that are far from optimal? Deborah Wallace and her husband and colleague Rodrick Wallace argue that in the United States, the recovery of such ecosystems depends on things like full employment at jobs with benefits and the enforcement of civil rights laws. In the Northern Ireland context, social justice will have other meanings, but whatever the meanings, it is that larger re-creation of a just society that is that path out of chronic disaster. For more from Mindy Fullilove Thompson, check out her new book Urban Alchemy available by clicking here. Mindy Thompson Fullilove, a psychiatrist, is a professor of urban policy and health at the New School, and author of Root Shock and Urban Alchemy.